It’s been awhile since I’ve posted an inspiration board – I plan on posting these more frequently in the New Year! :) Today’s board is inspired by shades of dusty blue as seen in the succulents on the top left. I love the idea of pale blues, light gray, white and a dark blue accent for a winter wedding. What do you think? I also love this color combo. It feels so sumptuous and can be glam or casual, winter or spring. That cheese display looks SO yummy! Loving the cool colours. Would be perfect for a winter wedding! I love the color of succulents. Beautiful inspiration board. The dusky blue could be glam or more casual, love this versatile color. I do love that light, light blue and grey for a winter wedding. It’s very elegant. The blues are great. We recently shot a bridal shower with a Breakfast at Tiffany’s theme. Though it started with the Tiffany blue, your softer blues were incorporated, as was china in the colors of your cheeses on the board. It was beautiful. That is, until the bridal party gift bags caught on fire. That added red, orange and yellow to the color palette, rather unexpectedly. Let’s just say, these colors are smokin’! 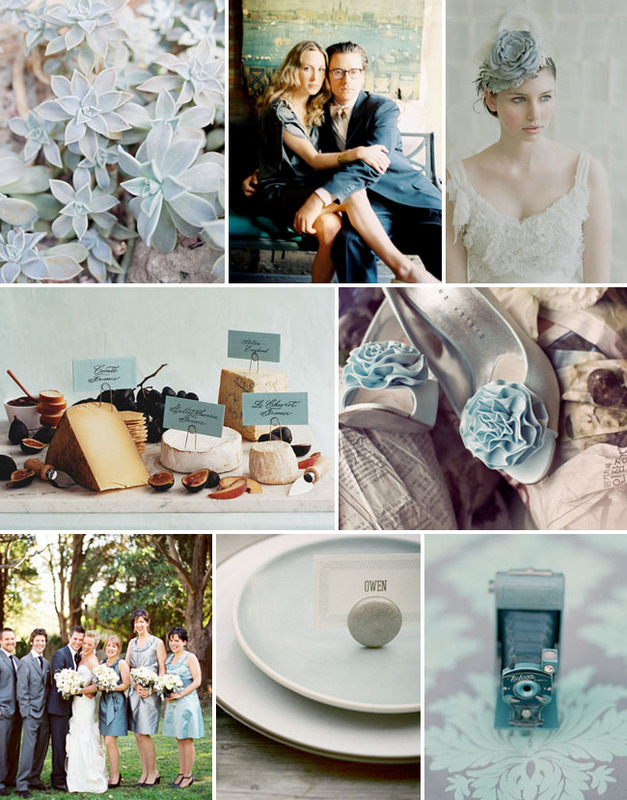 Oh I love this board…I agree…GREAT winter wedding colors!!!! love the twigs and honey headpiece! I can’t get enough of succulents. This color palette would be absolutely perfect for a winter wedding! I love the colour pallet! Very inspirational!